William Rothenstein, the fifth of the six children of Moritz Rothenstein (1836–1915) and his wife, Bertha Dux (1844–1912), was born at 4 Spring Bank, Bradford, on 29th January, 1872. His father, a businessman, had arrived from Hildesheim, Lower Saxony, in 1859. Rothenstein was educated at Bradford Grammar School where he developed a strong interest in art. In 1888 he went to the Slade School of Fine Art where he came under the influence of Alphonse Legros. The following year he attended the Académie Julian in Paris. During this period he met Roger Fry, Oscar Wilde, Walter Sickert, James Whistler, Henri de Toulouse-Lautrec, Camille Pissarro, Edgar Degas and Paul Verlaine. His biographer, Mary Lago, has pointed out: "He became known as a person with a gift for friendship and as a precocious talent." Max Beerbohm commented: "He was a wit. He was brimful of ideas. He knew Whistler. He knew Edmond de Goncourt. He knew everyone in Paris. He knew them all by heart. He was Paris in Oxford." As a result of his contacts, Rothenstein was commissioned to produce Oxford Characters (1896) and English Portraits (1898). On 11th June 1899, Rothenstein married Alice Mary Knewstub (1869–1955), who had appeared on the stage as Alice Kingsley. They had four children, John, William, Rachel and Betty. He rented a studio in Spitalfields and began his eight Synagogue Paintings. These paintings dealt with Jewish religious life. Rothenstein took a keen interest in the work of young artists. This included Augustus John who wrote in his autobiography, Chiaroscuro: "Encouraged by Will Rothenstein, I held my first show at the newly established Carfax Gallery, Ryder Street, St. James's... My little show was a success. I made thirty pounds. With this sum in my pocket there was nothing to prevent me joining Will Rothenstein, Orpen and Charles Conder in France. Rothenstein had found a good spot not far from Étretat on the Normandy coast." Rothenstein, Augustus John and Charles Conder went to Paris to visit Oscar Wilde. John later recalled: "I had heard a lot about Oscar, of course, and on meeting him was not in the least disappointed, except in one respect: prison discipline had left one, and apparently only one, mark on him, and that not irremediable: his hair was cut short... We assembled first at the Cafe de la Regence.... The Monarch of the dinner-table seemed none the worse for his recent misadventures and showed no sign of bitterness, resentment or remorse. Surrounded by devout adherents, he repaid their hospitality by an easy flow of practised wit and wisdom, by which he seemed to amuse himself as much as anybody. The obligation of continual applause I, for one, found irksome. Never, I thought, had the face of praise looked more foolish." In 1907 Rothenstein gave important support to Jacob Epstein. Rothenstein also took a keen interest in the career of Mark Gertler. After seeing the work of the sixteen-year-old East Ender in 1908 he wrote to his father: "It is never easy to prophesy regarding the future of an artist but I do sincerely believe that your son has gifts of a high order, and that if he will cultivate them with love and care, that you will one day have reason to be proud of him. I believe that a good artist is a very noble man, and it is worth while giving up many things which men consider very important, for others which we think still more so. From the little I could see of the character of your son, I have faith in him and I hope and believe he will make the best possible use of the opportunities I gather you are going to be generous enough to give him." Rothenstein managed to secure a place at the Slade School of Fine Art and arranged for his fees to be paid by the Jewish Educational Aid Society. Rothenstein took a keen interest in Mughal Painting and in 1910 established an India Society to educate the British public about Indian arts. Later that year he went to India with the painter Christiana Herringham, who had been involved in a project copying the rapidly deteriorating Buddhist wall-paintings in the Ajanta Caves. While in Calcutta (Kolcata) he met the poet Rabindranath Tagore. It has been claimed by Mary Lago that: "The influence of Indian art led to changes in Rothenstein's own painting: enamoured of the mass and solidity of Indian architecture, his own Indian scenes became heavier in style where formerly they had been light and delicate." While he was in India, Roger Fry, Clive Bell and Desmond MacCarthy were in Paris visiting "Parisian dealers and private collectors, arranging an assortment of paintings to exhibit at the Grafton Galleries" in Mayfair. This included a selection of paintings by Pablo Picasso, Henri Matisse, Paul Cézanne, Édouard Manet, Paul Gauguin, André Derain and Vincent Van Gogh. As the author of Crisis of Brilliance (2009) has pointed out: "Although some of these paintings were already twenty or even thirty years old - and four of the five major artists represented were dead - they were new to most Londoners." This exhibition had a marked impression on the work of Duncan Grant, Vanessa Bell and Spencer Gore. Henry Tonks, one of Britain's leading artists and the most important teacher at the Slade Art School, told his students that although he could not prevent them visiting the Grafton Galleries, he could tell them "how very much better pleased he would be if we did not risk contamination but stayed away". The critic for The Pall Mall Gazette described the paintings as the "output of a lunatic asylum". Robert Ross of The Morning Post agreed claiming the "emotions of these painters... are of no interest except to the student of pathology and the specialist in abnormality". These comments were especially hurtful to Fry as his wife had recently been committed to an institution suffering from schizophrenia. Paul Nash recalled that he saw Claude Phillips, the art critic of The Daily Telegraph, on leaving the exhibition, "threw down his catalogue upon the threshold of the Grafton Galleries and stamped on it." Rothenstein also disliked Fry's post-impressionist exhibition. He wrote in his autobiography, Men and Memories (1932) that he feared that the excessive publicity that the exhibition received, would seduce younger artists from "more personal, more scrupulous work". Rothenstein was in great demand as a lecturer and he used this position to deal with "philosophical questions concerning the meaning of art, the function of art schools and museums, the artist's role in an industrial culture, and, in the decline of personal patronage, the importance of generating municipal support for artists and craftsmen." On the outbreak of First World War in 1914 the Rothenstein family suffered from strong anti-German feeling in Britain. The three brothers decided to change the family name to Rutherston. Charles and Albert went through with the change but at the last minute William decided that it "meant too great a sacrifice of continuity and identity" and remained as Rothenstein. Only two photographers, both army officers, were allowed to take pictures of the Western Front. The penalty for anyone else caught taking a photograph of the war was the firing squad. Charles Masterman, head of the War Propaganda Bureau (WPB), was aware that the right sort of pictures would help the war effort. In May 1916 Masterman recruited the artist, Muirhead Bone. 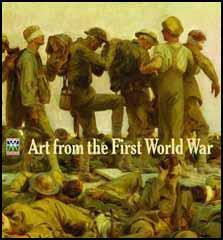 He was sent to France and by October had produced 150 drawings of the war. When Bone returned to England he was replaced by his brother-in-law, Francis Dodd, who had been working for the Manchester Guardian. Rothenstein offered his services to the WPB but because of his German connections he was initially turned down. 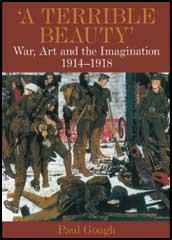 However, in December 1917 he was allowed to join other artists abroad including Eric Kennington, William Orpen, Paul Nash, John Nash, C. R. W. Nevinson, John Sargent, Augustus John, Henry Lamb, Colin Gill, William Roberts, Wyndham Lewis, Stanley Spencer, Philip Wilson Steer, George Clausen, Bernard Meninsky, Charles Pears, Sydney Carline, David Bomberg, Austin Osman Spare, Gilbert Ledward and Charles Jagger. Soon after he arrived on the Somme front he was arrested as a spy. He stayed with the British Fifth Army in 1918 and during the German Spring Offensive, served as a unofficial medical orderly. He returned to England in March and his pictures were exhibited in May, 1918. 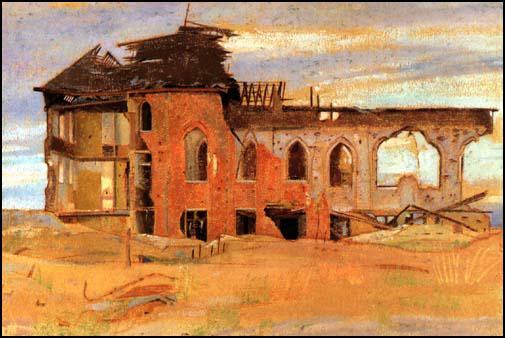 Pictures by Rothenstein included The Ypres Salient and Talbot House, Ypres. After the war Rothenstein returned to London. In 1919 Herbert Fisher, president of the Board of Education, appointed Rothenstein to write a report on the Royal College of Art. Rothenstein's report found that "the separation between training and employment for artists on the one hand, and for designers and industrial craftsmen on the other, was imbalanced, and advised that art training should encourage experimentation and flexibility for both." Fisher then appointed Rothenstein, as principal of the college. Rothenstein continued to promote the careers of experimental artists such as Henry Moore. He neglected his own work and as Mary Lago has pointed out: "His greater intensity and earnestness were evident in his habitual dissatisfaction with his own work, his fears about loss of facility in draughtsmanship, and his concern over the spiritual content both in his own work and that of his colleagues." He also wrote two volumes of autobiograpy, Men and Memories (1932) and Since Fifty (1939). Although sixty-six when the Second World War started, Rothenstein, who was suffering from heart problems, became an artist with the Royal Air Force. Unable to go abroad he made portrait drawings of airmen at RAF bases in England. William Rothenstein died at his home on 14th February 1945 and was buried at St Bartholomew's Church, Oakridge, Gloucestershire. It is never easy to prophesy regarding the future of an artist but I do sincerely believe that your son has gifts of a high order, and that if he will cultivate them with love and care, that you will one day have reason to be proud of him. I believe that a good artist is a very noble man, and it is worth while giving up many things which men consider very important, for others which we think still more so. From the little I could see of the character of your son, I have faith in him and I hope and believe he will make the best possible use of the opportunities I gather you are going to be generous enough to give him.